The DNSODM200_SSRAMx4 is a SODIMM module that can be installed in a 200-pin DDR2 SODIMM socket. 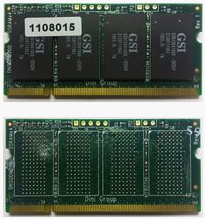 This module contains four SSRAMs chips in a 8M x 18 configuration (GS8128418GB-200V) or eight chips in a 8M x 18 (GS8128418GB-200V). Stuffed with the GSI Technology GS8128418GB-200V, the DNSODM200_SSRAMx4 is configured in 'pipeline' mode. The frequency of operation is 200MHz(GS8128418GB-200V). The DNSODM200_SSRAMx4 is compatible with the 200-pin SODIMM DDR2 sockets on all SODIMM socket equipped Dini products.